Leo KJ6HI with a 7lb. rainbow trout caught on 11/08/00 at a local lake called Santa Ana Rivers Lakes in the city of Anaheim, CA. I went fishing with some amateur buddies, Elipidio N6VJD, Harvey KB6VHL, & Steve KC6CFM. One of my best friends Elipidio Cobian N6VJD (formerly from the group CLEARWATER) "Hey he also played at WOODSTOCK" enjoying the nice weather on a great fishing day. and holding a stringer of rainbow trout. Me KJ6HI holding a 4 pound rainbow trout on Lake Mary in the Mammoth Lakes area. Looking on is Don W6YNR my good friend that lives in Mammoth Lakes. Me KJ6HI holding some great rainbow trout, that Wayne KJ6HP, and myself caught on a 5 day fishing trip to Otter Creek Resorvoir in the wonderful state of Utah. My friend Wayne did most of the netting because I caught 90% of the catch. We were operating 10 meter mobile running 200 watts. The band was wide open, and everyone wanted to talk to us, over 300 QSO that trip. 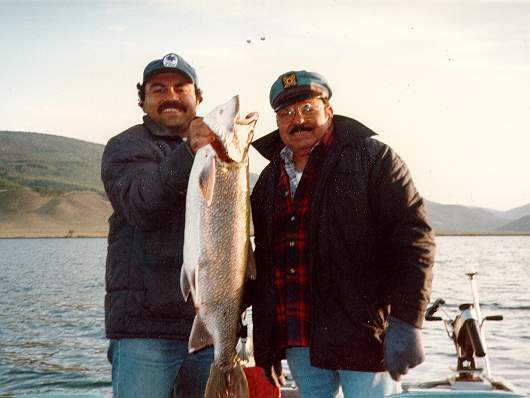 Leo Jr. KJ6HI, and Leo Sr. fishing at Fish Lake in the state of Utah. The fish I caught was a 22lb. Mackinaw (Lake) Trout. Operated alot of 10 meters there with my Kenwood TS-440S/AT.